You can't really tell from this photo, but this baby sharptailed snake (Contia tenuis) was less than 3 inches long when photographed. It was found in a backyard in San Anselmo, California, a few days before Thanksgiving. I'm impressed by your photos, particularly this one, as I have tried and failed several times to get a good macro shot of a small eastern worm snake (Carphophis amoenus). They just won't hold still. How about a blog posting on your photography techniques? Thanks for the ups. I just use Canon point-and-shoot digital cameras. I believe this shot was with an Elph SD 550. I'm currently using an S3 IS. I just set it on macro and shoot. This snake was fairly cooled down as we found it in a little garden pond, so it wasn't moving when I took these shots. Wow, nice that you found a baby. When I lived in San Anselmo I had them in my yard. Found one on top of the compost heap and another, the first I found, was under a piece of tar roof tile in the driveway. I could reliably find it there just about whenever I wanted. They're like little pieces of jewelry, especially when tangled up in a ball. How did you happen to be in San Anselmo? 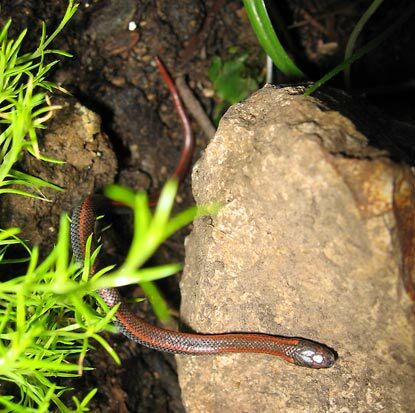 Far from home and lucky for you to encounter one of these only locally common snakes. How did you happen to be in San Anselmo? I've got good friends who bought a house there a few years back. It's where I stay when I visit San Francisco.